We have volunteer opportunities for Therapists, Brand Ambassadors, Fundraisers and Administrators. If you are a complementary therapist, with the appropriate skills and a little time to spare, we would be happy for you to join us. The Co-operative is based in local health centres and at Sporting Club Thamesmead, with rotas covered on a mutually agreed basis. We will reimburse expenses up to a set amount. 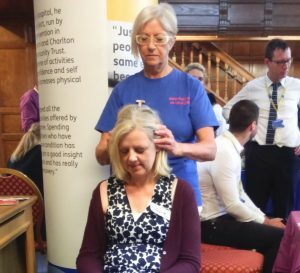 We are frequently asked to provide therapists for corporate and community events run by other organisations. These may be covered by sessional fees for those attending on behalf of the Co-operative. To be involved with an organisation dedicated to promoting health and well being in the community. A supportive and positive environment. An induction with opportunities to undertake additional training when available, and to gain experience. Treat fellow volunteers and all those connected to the organisation with courtesy and respect. Support our aims and objectives. Remember that you are acting as a representative of the Co-operative. Reach a shared understanding with us on your role and commitment. Are open and honest in your dealings with us. Providing information on the project, leaflet drops and ‘door knocking’ to households, surgeries, schools, businesses and other organisations within the area. To assist during open days and other events. To be involved with an organisation dedicated to promoting health and wellbeing in the community. An induction with opportunities to undertake appropriate training and to gain experience. Reimbursement of any reasonable out-of-pocket expenses incurred. Should you be interested in either one of these roles, please call us or text us via WhatsApp on 07908 034081 to arrange meeting or email us feelgoodco-op@hotmail.co.uk for an application form.